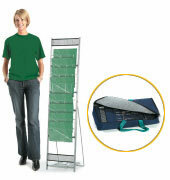 The Spring is a super portable “go-anywhere” literature rack that takes under 1 min to put up. 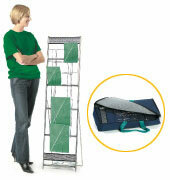 The pockets, made of webbed fabric, allow the unit to roll away neatly into a compact bag. The Fountain is a hugely popular, “easy-up” stylish literature holder. You can pre-load it with literature, access it from both sides and concertina it away into a smart protective carry case. This superb literature rack is available with 6 or 10 A4 smart chrome baskets. 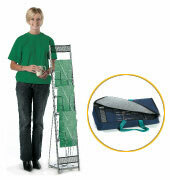 The stand is made from 3 lightweight aluminium sections that simply slot together and pack flat in a padded carry bag. Part of a range that fit nicely side by side to accommodate all formats. This superb literature rack is available with 8 A4 landscape smart chrome baskets. 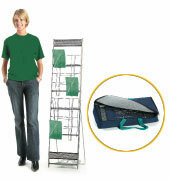 The stand is made from 3 lightweight aluminium sections that simply slot together and pack flat in a padded carry bag. Part of a range that fit nicely side by side to accommodate all formats. This superb literature rack is available with 5 A4 and 8 A5 smart chrome baskets. 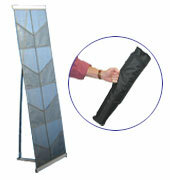 The stand is made from 3 lightweight aluminium sections that simply slot together and pack flat in a padded carry bag. Part of a range that fit nicely side by side to accommodate all formats. 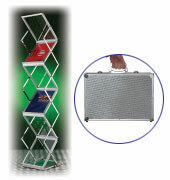 This superb literature rack is available with 16 A5 smart chrome baskets. 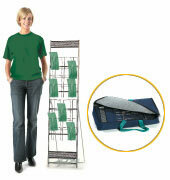 The stand is made from 3 lightweight aluminium sections that simply slot together and pack flat in a padded carry bag. Part of a range that fit nicely side by side to accommodate all formats. This superb literature rack is available with 5A4 and 12DL smart chrome baskets. The stand is made from 3 lightweight aluminium sections that simply slot together and pack flat in a padded carry bag. Part of a range that fit nicely side by side to accommodate all formats. This superb literature rack is available with 24DL smart chrome baskets. 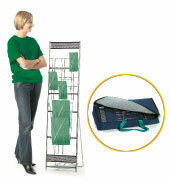 The stand is made from 3 lightweight aluminium sections that simply slot together and pack flat in a padded carry bag. Part of a range that fit nicely side by side to accommodate all formats.